The Great Hall of the University of Ulster's Magee campus was packed to capacity to hear internationally acclaimed writer Seamus Deane take part in ‘Life Stories’, the second in a series of public conversations at the campus with distinguished honorary graduates of the University. The Derry-born poet, literary critic and novelist, was interviewed by Professor Paul Moore, Head of the School of Creative Arts at Magee, this week about the influence of his childhood, schooling and his lifetime of intensive academic research, on his literary output , particularly his award-winning novel, ‘Reading in the Dark’. The novel was an international best-seller when published in 1996 and was nominated for the Booker Prize in 1996. It was translated into 20 languages and won The Irish Times International Fiction Prize and the Irish Literature Prize. The conversation was interspersed with readings from ‘Reading in the Dark’ from Theresa Kane, a research student at Magee who is a teacher at St Mary’s Primary School in Tempo, Co Fermanagh. The book is in the form of a novel-in-stories that interweave themes of secrecy, discovery, dark humour, spirit hauntings, betrayal and death amid old family tales and folklore. Written from the viewpoint of a young Catholic boy, it is set in Derry in the 1940s and ’50 and harkens back to thed post-Partition violent atmosphere of the 1920s that holdsan eerie resonance of the more recent ‘‘Troubles’ that scarred Northern Ireland. Deane was Professor of Modern English and American Literature in University College Dublin for many years and Keough Professor of Irish Studies at the University of Notre Dame, Indiana, USA, from 1993 to 2005. He holds the honorary degree of Doctor of Letters from Ulster for services to Irish Literature. Professor Deirdre Heenan, Acting Provost and Dean of Academic Development at Magee, presented him with a copy of ‘Atlantic Gateway’ in thanks for taking part in the event and as a token of the “enduring fondness in which he is held by the University. The book, about the pivotal role of the City and Port of Londonderry in the development of the North West region, was written by three academics at the Magee campus, Dr William Kelly, Professor Robert Gavin and Professor Dolores O’Reilly. 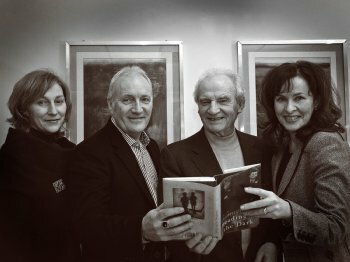 CAPTION: Author Seamus Deane (second from right) meets up with, from left Kate Bond, Head of Development and Alumni, Professor Paul Moore, Head of the School of Creative Arts and Professor Deirdre Heenan, Acting Provost and Dean of Academic Development, before the ‘Life Stories’ event at Magee.